“Meeting the need for safe water and sanitation coupled with protection of the environment and prevention of pollutants is essential to improve the health and living conditions of billions of people -- to diminish the incidence of diseases while improving education and economic well-being and elevating billions out of vicious cycles of poverty.” Dr. Jens Aagaard-Hansen and Janine M. H. Selendy from the Introduction to the book. 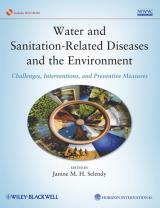 Written by 59 authorities from various related specialties, this book presents conditions responsible for water and sanitation-related diseases, the pathogens and their biology, morbidity and mortality resulting from lack of safe water and sanitation, distribution of these diseases, and the conditions that must be met to reduce or eradicate them. Preventive measures and solutions are presented throughout. This book is an essential resource for all graduate students, postdoctoral scholars, and professionals in infectious disease, public health and medicine, chemical and environmental engineering, and international affairs. Recognizing the consequences of climate change now evident and that need to be anticipated in order to minimize foreseeable and unforeseen consequences, climate change is factored into the 2nd Edition’s updated and revised chapters and new chapters. 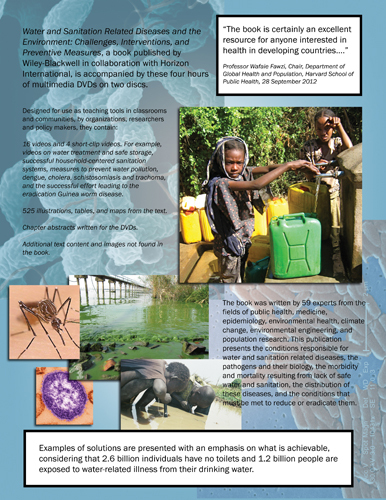 The new edition is entitled "Water and Sanitation Related Diseases and the Changing Environment: Challenges, Interventions and Preventive Measures." · 16 videos and 4 short-clip videos. For example, videos on water treatment and safe storage, successful household-centered sanitation systems, measures to prevent water pollution, dengue, cholera, schistosomiasis and trachoma, and the successful effort leading to the eradication Guinea worm disease. · 525 illustrations, tables, and maps from the text. · Additional text content and images not found in the book. Click here to go to the DVD flier. “This is a truly interdisciplinary book and reflects really well the need to work across scientific boundaries, and I think shows what can be achieved through collaboration.” (Society for General Microbiology, 15 May 2012). Audience: "It is hard to put limits on the applicability and importance of this book. Its editor believes it is an essential resource for graduate students and postdoctoral scholars as well as professionals. I'm going to add business and community leaders to the list. The book belongs on the bookshelf of every NGO or parent organization that hopes to improve lives around the globe. "